Wisdom teeth are your very last molars in your mouth. Dentists call them 3rd molars. These teeth have been labeled wisdom teeth due to the age when they erupt. Typically these teeth erupt when we are older and wiser compared to other teeth in our mouths. Wisdom teeth are often congenitally missing and it seems that rate is increasing. 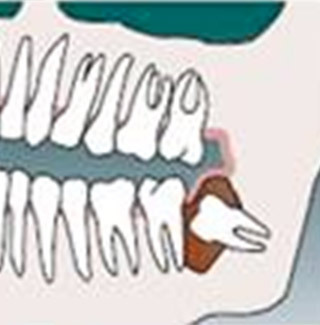 Below is an illustration that shows us where our wisdom teeth or 3rd molars sit in our mouths. What is the difference between wisdom teeth and impacted wisdom teeth? Impacted wisdom in simple terms means the tooth cannot properly erupt due to insuffi-cient space or improper angulation for eruption. Some wisdom teeth erupt completely fine without any problems but some can cause much pain and disease in the area. And yet others will stay buried in the bone and will never come out. 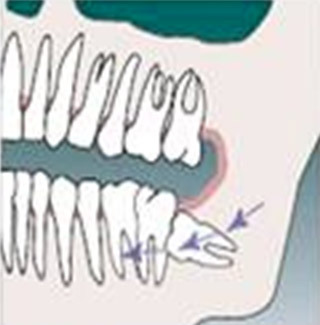 The image above illus-trates a couple impacted wisdom teeth. Make note of the angle of the wisdom teeth compared the the other teeth. Due to the angle, proper eruption is unlikely. If you are looking for a wisdom teeth doctor in Tempe call us to get a consultation about your spe-cific mouth. Sometimes we elect to have them removed and sometimes we keep them and every patient is different. 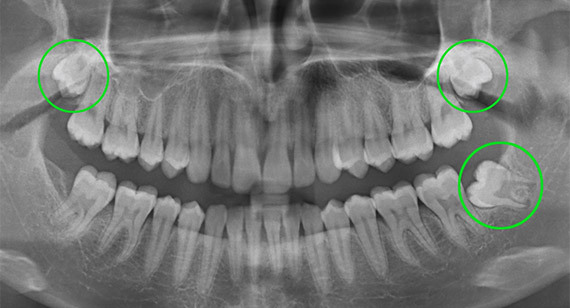 How do you determine if my wisdom teeth need to come out? This is a common question and in the field of dentistry there is a lot of debate about our 3rd molars. When discussing if wisdom teeth should stay or go, our philosophy lays in the middle. In some it’s no question the teeth will need to be removed and others do not require removal. Dr Chase Davis still has his wisdom teeth. 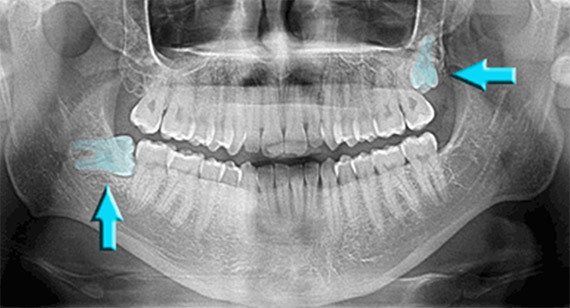 We examine every patient intraorally and with panoramic radiographs (x-rays). 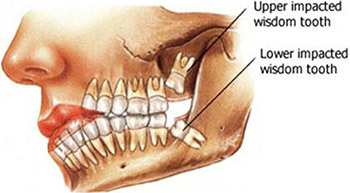 Below is a couple images that illustrates what they are and where the wisdom teeth are. What is the best time to get my wisdom teeth out? So a common theme to the answers to these questions are “it depends.” Every mouth is different and the ages vary when we think it’s best to have them removed. We generally like to remove them when the roots are 1/2-2/3 formed. This allows us to remove them quickly and limit complications. If we must generalize the best ages are between 15-19. However, our teenager’s mouths are maturing younger so the ages get a tad bit younger. Not only are our teenagers’ bodies maturing at a younger age but our jaws a decreasing in size which tends to make more wisdom teeth impacted than 2000 years ago. Should I be sedated to have my wisdom teeth out? This is one of the most common questions we get about wisdom teeth in Tempe and it is a very important one. We offer many options when it comes to sedation and when you come in we will discuss them at length. Many elect to be sedated while others elect to be awake. Either way you choose you will be made comfortable and the procedure will be completed as efficiently as possible. Will it hurt to get my wisdom teeth out? No. During the procedure you will be comfortable and in control of the situation. If you are nervous or have dental anxiety you can elect to be sedated. You may be sore and have minimal pain for 1-3 days which we will help you get through but many patients have mild soreness and no post op pain. When you come in to have your wisdom teeth removed we will discuss this at length and some home remedies and prescriptions to help you get through the first couple days of soreness. What if I do not get my wisdom teeth out? Wisdom teeth or third molars are easier to have removed when you are younger. If you decide to delay treatment the removal of wisdom teeth can have more complications and post op pain can be worse and last longer. Below are some examples of what happens if you decide to not get them out. Many experience pressure when wisdom teeth are trying to come in. This pressure can be great and be very painful. Crowding can occur due to insufficient space. When crowding occurs cleaning the teeth can be even more difficult and we tend to see infections develop around the area. When proper cleaning cannot be achieved the 2nd molar can get damaged from decay on the back side. It can also cause periodontal conditions is this area which causes bone loss. There are many times the damage is so severe that we have to remove the wisdom tooth and the molar in front of it. A small balloon-like cyst can fill with fluid surrounding the impacted wisdom tooth. If the cyst is left untreated it can expand and cause damage to the nerve or bone, which would require surgery and bone grafting. Pericornitis is an infection that develops under the same flap of tissue that covers an unerupted wisdom tooth. This can be painful. Once the tissue swells sometimes the opposing wisdom tooth hits the tissue and causes even more pain. This pain can be treated in a variety of ways but the most popular would be to have them removed. As I mentioned above not everyone needs to have their wisdom teeth removed but if you do then you or your loved ones should do it sooner than later. When you come in we will answer all your questions and help you understand the procedure. 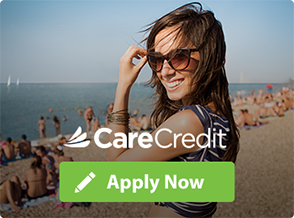 Call us today at 480-838-3103 to meet the best dentist in Tempe.